Yesterday marks the first day of the 15-day celebration of Chinese New Year. Though my family and I don't celebrate it, I thought it would be nice to enjoy an Asian dinner instead of the usual pasta or pizza that we normally have on a Sunday night. I got a sampler pack from Thai Kitchen® through Foodie Blogroll last week, so I decided to try making Satay Partay - a delicious chicken dish featuring Thai Kitchen®'s Coconut Milk, Premium Fish Sauce, Red Curry Paste, Lemongrass and Peanut Satay Sauce. This is an adaptation of the Satay recipe which originated in Indonesia and is also popular in other Southeast Asian countries, including Malaysia, Singapore, Brunei, and Thailand. 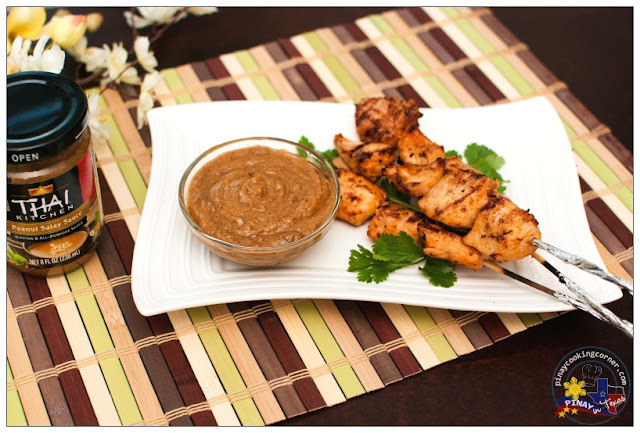 If you have tried making Chicken Satay before, you know how much ingredients you will need to make the perfect spice paste and peanut satay sauce needed in making this delectable dish. 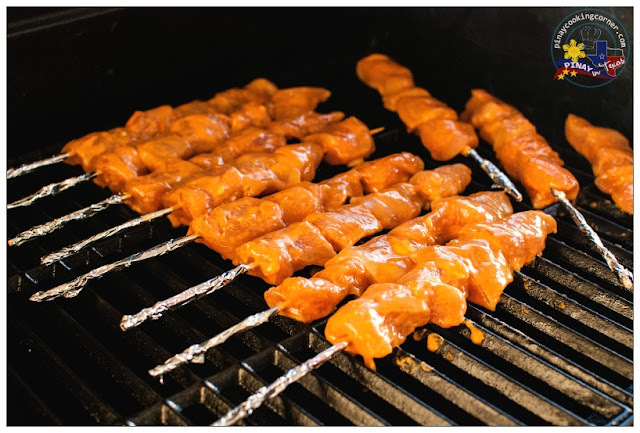 If you want to enjoy Chicken Satay but want to save time, using off-the-shelf satay marinade will be an excellent option. Thai Kitchen® can help you with that! They offer a complete line of Asian ingredients and convenience items, including sauces, curry pastes, fish sauce, coconut milk, noodle kits, and more which are great when you want to serve something up quick. Most of their products are free of gluten, artificial colors/flavors and MSG, so you can feel good about serving them to your family. We all enjoyed our dinner last night. Thanks to Thai Kitchen®'s Coconut Milk, Premium Fish Sauce, Red Curry Paste and Peanut Satay Sauce, I was able to prepare an authentic tasting Chicken Satay with less time and effort! My daughters said the Thai Kitchen®'s Satay Partay tastes close enough to the Chicken Satay I've made before, the recipe of which I got from Rasa Malaysia. I still prefer making everything from scratch whenever possible, but during busy weeknights or when I'm hosting parties or I'm being too lazy to spend time in the kitchen, I can always use help from a dependable convenience food product line like that of Thai Kitchen®. The best thing about it is no one would even know that I didn’t make it all from scratch because the ingredients taste so fresh! Thai Kitchen® products are available in most grocery stores here in the US so be sure to check and try them out for your next big party or even for your regular family dinner. Their website features an extensive library of easy and quick recipes that I'm sure you'll love to try! * You will need 12 bamboo skewers. 1. 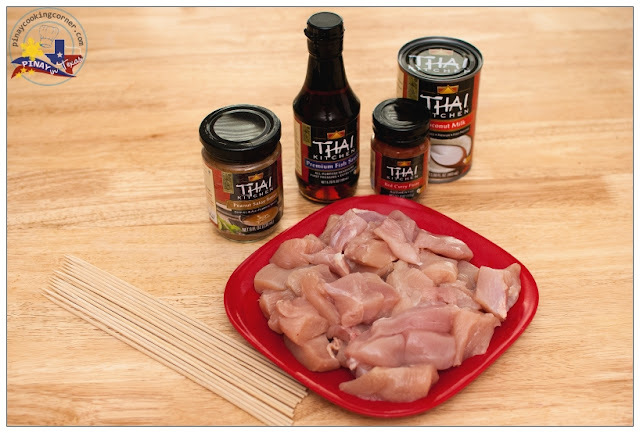 Prepare marinade by mixing Thai Kitchen® Coconut Milk, Thai Kitchen® Premium Fish Sauce and Thai Kitchen® Red Curry Paste in a bowl until well blended. Toss chicken into marinade until well coated. Refrigerate one hour or longer for extra flavor. 2. Remove chicken from marinade. Discard any remaining marinade. Thread chicken strips onto skewers. Broil or grill over medium-high heat 3 minutes per side or until chicken is cooked through. 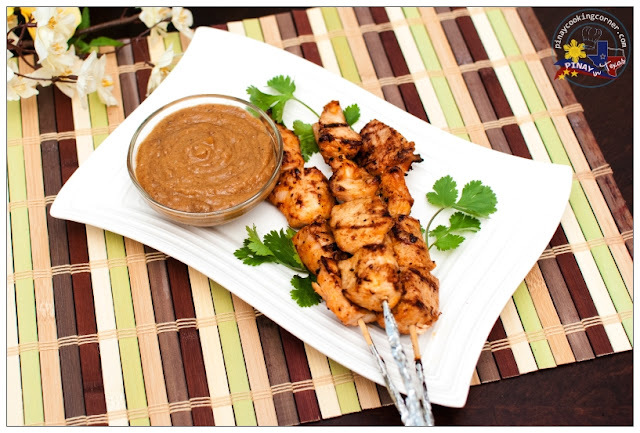 Serve with Thai Kitchen® Peanut Satay Sauce or Thai Kitchen® Sweet Red Chili Sauce for dipping. Tip: Soak bamboo skewers thoroughly in water for at least 30 minutes before threading with chicken. This prevents them from burning when on the grill. Check out Thai Kitchen and explore their amazing Asian cuisine ingredients! Thai Kitchen®'s ingredients and recipes offer simple solutions to spice up any celebration - and what better time to “thai” new dishes than Chinese New Year? The traditional 15-day celebration kicks off February 10, 2013, and is a perfect reason to gather a group of friends and try tasty Asian cuisine. From mild to spicy, appetizers to dessert, Thai Kitchen have something for every taste bud, sure to please even the most discerning palates. * This sponsorship is brought to you by Foodie Blogroll who PiTCC has partnered with for this promotion. I love thai food! Especially chicken satay like this :) it looks very yummy! Thank you for sharing this! I always think about making a chicken satay but I can never really figure it out! I'm a huge Thai Kitchen fan, especially the green and red curry pastes. I love what you did the various products of Thai kitchen and this is SO easy!!! Great chicken satay! Hi Tina, your chicken satay look awesome. Thanks for sharing the simple recipe. Lovely presentation.